At three days old, Jordan S. was diagnosed with cystic fibrosis (CF). Jordan’s treatment plan began with rigorous manual chest physical therapy (CPT) sessions, twice per day. After four exhausting years of performing CPT, they decided to switch to vest therapy. “We tried the two [other manufacturers’] vests that were available,” said Jordan’s dad Kevin. He and his wife both ran through a treatment cycle wearing each vest and decided on the inCourage® System. “It had the most freedom,” Kevin said. “[It] felt more comfortable, was less restrictive, and [we] felt we could get a deep breath.” These benefits ranked a top priority, knowing that Jordan would be using her device for life. 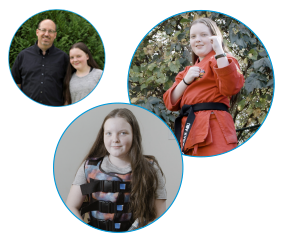 By staying on top of treatments, the busy teenager has been able to swim competitively, play the flute and earn a second-degree black belt in karate. Jordan explains that being an eighth grader with CF isn’t something that defines her life, but just a part of her normal routine. “The inCourage System has had an impact on my breathing because there’s less mucus in my lungs after treatments. It will keep your lungs healthier so it’s easier to breathe,” said Jordan.